Sen. Michael Bennet (D., Colo.) was so disgusted by 2020 Democratic presidential candidates considering "packing" the Supreme Court, he slammed his head on the table in front of a reporter. That's according to a new Washington Post story about the Colorado lawmaker, who's considering jumping into the race that already includes 15 candidates. 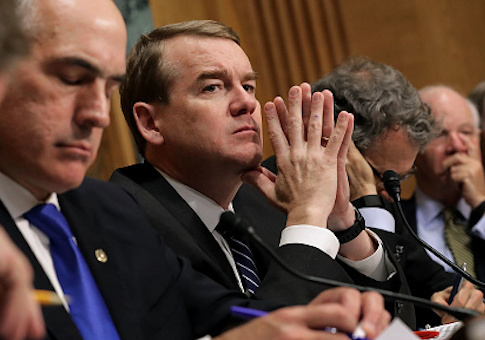 Sen. Michael Bennet (D-Colo.) slammed his head on the table four times when I asked what he thought about other Democratic presidential contenders embracing the idea of expanding the Supreme Court. "Having seen up close just how cynical and how vicious the tea party guys and the Freedom Caucus guys and Mitch McConnell have been, the last thing I want to do is be those guys," he said during an interview at a coffee shop here the Friday night before last. "What I want to do is beat these guys so that we can begin to govern again." Bennet is one of the many Democrats still fuming over the Supreme Court fight that wasn't in 2016, when President Barack Obama nominated Merrick Garland to fill the seat left by the death of Antonin Scalia. Senate Republicans didn't hold a hearing or vote for him, citing it being an election year. Donald Trump campaigned for president in part on nominating originalists to the judiciary. He nominated Neil Gorsuch to fill Scalia's place soon after taking office in 2017 and Gorsuch was confirmed that spring after Senate Majority Leader Mitch McConnell (R., Ky.) nuked the filibuster. Bennet is also angry about Gorsuch's confirmation and acknowledged that he went along with then-Senate Majority Leader Harry Reid (D., Nev.) in ending the filibuster for Obama's circuit court judges in 2013. "We didn't always follow the rules," Bennet said. "We changed the rules. People can decide whose fault it was. There's plenty of blame to go around. My point is that we owe something much better than this to the American people." Bennet also said he'll make a decision about entering the presidential race in the coming weeks and would hope to represent a view that's not quite so far-left. "I guess I'm starting to think strongly that we need a voice in this primary that's willing to make the kind of case that I think that I would make," he said. Article III of the Constitution does not specify the size of the Supreme Court. The Judiciary Act of 1869 was the most recent statute establishing its size as one chief justice and eight associate justices. Several prominent progressives have sought to put pressure on 2020 Democrats to embrace adding more judges. The left-wing groups "Pack the Courts" and "Demand Justice" are working together on what former Hillary Clinton spokesman Brian Fallon calls "reforming the court." This entry was posted in Politics and tagged 2020 Election, Beto O'Rourke, Brian Fallon, Elizabeth Warren, Kamala Harris, Michael Bennet, Supreme Court. Bookmark the permalink.